With texts by Arnold Witte, Edo Dijksterhuis, Pietje Tegenbosch, Riemer Knoop, Hans den Hartog Jager, Lex ter Braak and photos by Job Janssen. Taken together, Dutch corporations own a large amount of art. Little attention has been paid so far to the phenomenon of corporate art collecting, which is why the debate on corporate collections in the Netherlands is rarely about facts, often about opinion, and above all about expectations. 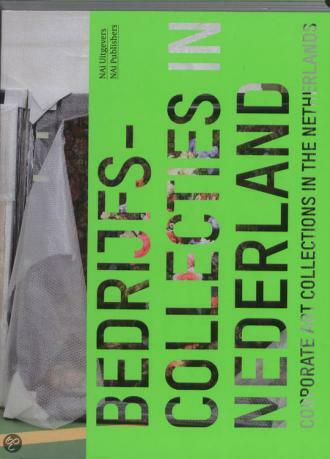 Various perspectives are applied in this publication to obtain a clear picture of the dynamics behind the Dutch corporate collections and their impact on the art world. It contains an analysis of the phenomenon, a comparison with developments abroad, and contributions by some of those involved from the Dutch art world. The recurrent question is that of how the intrinsic value of the art relates to the corporate purposes that these collections often have to serve. Which tasks do the various parties in the cultural field attribute to the Dutch corporate collections, and what effect do they have on the art? The result is a stimulating and provocative book on an unjustly neglected phenomenon in the Dutch art world.